Projects - and Project managers - are failing at an alarming rate. In the IT industry only 24% of projects succeed according to the Government Office of Commerce. Railtrack and the upgrade of the NHS are high profile examples of large project failures. And there are plenty of low-profile examples available too - as any viewer of Channel 4's Property Ladder programme will confirm. 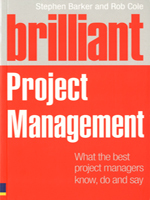 In an ever growing market, Brilliant Project Management stands out from the crowd. This revised edition is part of the high profile Brilliant series and the first edition redefined the mould for books in this category. Through its engaging and entertaining approach, Brilliant Project Management does more than just talk you through the process. It provides practical advice and techniques taken from people's experience in the real world so you always know exactly what to do and say to make your project a success. Brilliant Project Management highlights the areas where your actions and behaviours will make the difference between failure, an average outcome, and a huge success. Whether you're always behind schedule and fighting to catch up, haven't a clue where to start, or simply want your projects to be more successful, this book will teach you simple and effective techniques to leading successful projects every time.